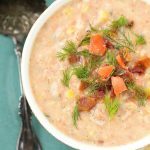 Salmon Chowder is a rich, delicious chowder you can make from leftover salmon (or canned, whatever you have). Corn also plays a part, but not enough to outshine the salmon. I think a wild Alaska Sockeye salmon has the richest flavor. Neighbors. Sometimes you get lucky and you end up with neighbors who become treasured friends. We live in a very small neighborhood, there are only 5 houses on our little road. I think we hit the neighbor lottery! We really love all of our neighbors, and know that they will be there if we ever need anything, as we will be for them. Our neighbors across the street texted me yesterday and asked if we would like some Copper River Salmon that they had grilled, and just had too much left over. Um, yeah! I was so excited, as Copper River Salmon is my absolute, hands down, favorite fish! We get a lot of variety in the fish department here in the Greater Puget Sound area, but that Copper River Salmon from Alaska is the best! And so expensive! We haven’t bought any yet this year, so when I got that text I was so excited, and so grateful! And I knew that I wanted to make some Salmon Chowder with it. What a great way to use up leftover salmon! We did eat some ‘as is’ first, I mean, you just have to enjoy that tender salmon full of that good fat! I made the Salmon Chowder from the drier pieces (they weren’t even that dry!). Even though it’s Summer right now, I had no issue with making a salmon chowder. It was necessary! When Bryen got home from work I gave him a taste and he said “Oh yeah” with a big contented sigh. So I knew it was the right choice. Needless to say, we had a great dinner together once Paul got home and joined us! 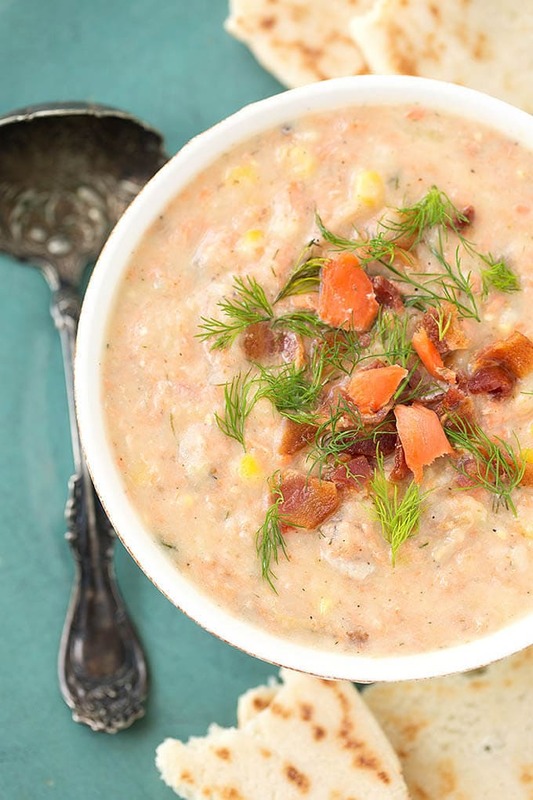 This salmon chowder starts a little differently, as after you cut the kernels from the corn cob, you boil the cobs to add their flavor to the stock. It’s subtle, but adds a wonderful depth to the salmon chowder. If you don’t have fresh corn, no worries, you can use frozen or canned. It will still be wonderful! If you have any left over, maybe you can share with your neighbor! 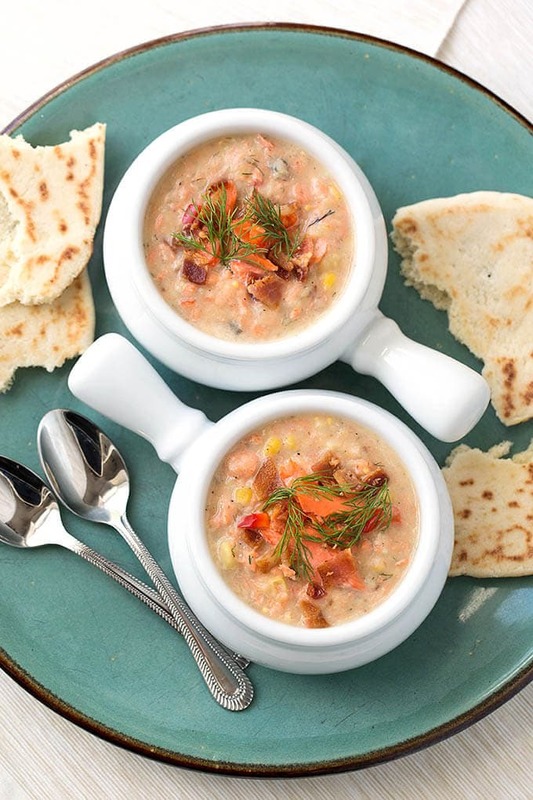 This Salmon Chowder recipe is perfect for using leftover salmon. Full of flavor with dill, fresh corn, sherry, and a hint of bacon. Truly delicious salmon chowder! Serve it with some crusty bread. Cut the corn kernels from the cobs and set kernels aside. Place the cobs and the Bay Leaf in a 5 qt pot and pour the water or broth over them. Cover pot, reduce heat to medium low, and let them simmer for about 5 minutes. Add the potatoes, garlic, salt, and pepper. Cover, and cook about 10-15 minutes, or until potatoes are tender. Meanwhile, cook the bacon in a small skillet. Remove and set aside when just crisp. Add the onion to the bacon drippings and cook until tender and almost translucent. Add the bell peppers and the corn kernels. Cook about 2 minutes. Stir the cooking sherry and the butter into the onion mixture. Take off of heat. Remove the cobs from the pot and discard. Mash the potatoes in the pot using a hand masher. This will thicken the chowder and leave some texture. Add the salmon, dill, and the onion mixture. Heat through. Turn off heat. Stir in the heavy cream. Taste test for seasoning, and adjust salt, pepper, and/or dill to taste. Smoked salmon is also wonderful in this recipe! Or use a combination of half smoked/half not. I have try this recepie personaly, my entire family love this and happy that the way you use ingedient.Try smoked salmon on apples or pears with cream cheese. Use the fruit instead of a bagle.